In spring 2018 a group of twenty-five community members from different towns in Central Oregon gathered at the Crook County Library in Prineville for Oregon Humanities’ first Bridging Oregon program. They came together for one Saturday morning each month for four months, shared food and stories, and exchanged seedlings. Through the four conversations, participants explored the complexities of their own personal experiences in the region and the unexpected ways they could come together to create stronger communities in Central Oregon. Read about one participant’s experience during Bridging Oregon in Prineville. 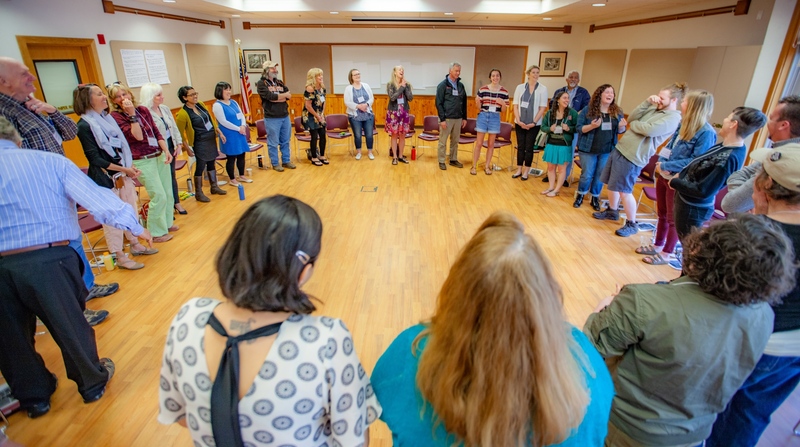 In the fall of 2018, in partnership with Josephine Community Libraries and United Way of Jackson County, we continued the work with a new group of people convening in Southern Oregon. The series took place from September through November. The Bridging Oregon experience reminds me to remember and practice what is often thought of as “village life.” This is not a new concept, yet given the challenges/terrors of these times, practicing village life feels like an essential life skill. Through Bridging Oregon, my sense of “revillaging” emerged spontaneously as those of us from three counties came together and found common ground through values of human decency. In these unsettling moments we remember ourselves as villagers, gathering at the village square, coming together, to listen, to understand, to grieve, to cry, and to reconcile. It was not always easy listening, yet over four weeks the village sustained itself. We gathered as villagers and found our common-unity. Both Bridging Oregon cohorts gathered for four half-day sessions facilitated by one local facilitator and a guest facilitator, both trained by Oregon Humanities. The groups addressed how perceived and real differences inform our experiences and gained skills in how to facilitate challenging conversations in their personal and professional networks. "It’s helpful to start something really small. It gives me hope because I see people's hearts. It’s a mirror put up to my face and it’s different than me." "My naïveté was challenged. And opportunity for growth. Listen to understand not to respond."